When most vapers first make the switch, tobacco flavored e-liquid seems like the best way to move your nicotine habit away from the combusted, cured plant matter loaded with carcinogens and toxins. However, vapers quickly learn that it’s hard to accurately replicate the true taste of tobacco: somehow, without the 4,000-plus chemicals and the pungent, burning smoky aroma they bring, the taste just tends to be a little lacking. But some of the very best tobacco e-liquids still manage to beat the odds and produce something well-worth vaping. Generally, tobacco e-liquid either opts for a sweetened, RY4-style flavor – or a tobacco backed up with fruity elements – or a pure, more natural tobacco-only approach. This list includes 10 “must-vape” e-liquids of the latter type, with a focus on replicating the taste of tobacco as genuinely as possible (there’s a companion to this list for sweetened options), offering a brief run-down of some of the best tobacco flavored e-juice on the market today. We’ve tried some of these ourselves, but we’ve also combed through suggestions from vapers and user reviews to fill this list with some of the most widely-recommended natural-tasting tobaccos on the market – looking at both ratings and the number of reviews each product has (meaning that a 4.5/5 rated juice with 100 reviews is better than a 5/5 juice with only 10 reviews, for example), as well as any awards picked up by the juices. Admittedly, though, there are some problems with this approach to finding the best tobacco e-juice – for example, a more popular company’s juices will have more reviews than a less popular but still awesome company’s – so we’ve had to rely on an element of judgment too. So, without further ado, here’s our list of natural-tasting tobaccos you’ve got to try. Dragon’s Fire is one of the naturally-extracted tobacco (NET) e-liquids from Heather’s Heavenly Vapes, offering a robust and realistic tobacco e-liquid with a rich and slightly sweet flavor. There are a few widely-loved options from Heather’s Heavenly Vapes, the other NETs Legend and Dark Horse in particular, but for complexity of flavor and uniqueness Dragon’s Fire probably wins out. It might take a little getting used to – and it’s one that’s notably improved by a good steep – but it’s a definite must-vape. Reaper was Spinfuel’s e-liquid of the year for 2014, a six-tobacco blend shooting for a full-bodied flavor. The concept of mixing tobacco blends might seem abhorrent to a connoisseur, but when it’s done well the various elements of the different blends can play off each other – that’s what makes Reaper so well-loved. It’s widely-praised as rich, dark and full-bodied, offering a punchy, unadulterated tobacco flavor but without the harshness you’d expect from a blended mix. There is a touch of sweetness to soften the taste, but this is one for the true tobacco lover. Ahlusion is a favorite mixer among tobacco-loving vapers, and their Blue Grass Burley blend is billed as their take on natural, air-cured Kentucky burley tobacco, promising a warm, rich vape. The flavor is earthy and powerful, and while some are initially put off due to the strength of the taste, it’s one that grows on you over time. Despite the pungent flavor, Blue Grass Burley took the prize for best single variety NET e-liquid in the ECF’s second “NETty Awards,” and placed third for best NET overall. Additionally, Smooth Criminal is a sweeter tobacco from Ahlusion that also gets a lot of love. Good eJuice is another widely-recommended mixer with a nice selection of flavored and unflavored NET options on offer. Patriot Tobacco is their most-popular option, boasting elements of Louisiana perique, Virginia burley and Kentucky Cavendish, producing a full-bodied and rich e-liquid with a slight hint of sweetness to help it go down more smoothly. The tobacco is front and center, though, and the juice gains particular praise from anybody looking for an authentic tobacco taste – with many saying it’s the only thing that got them off combusted tobacco for good. For those looking for a slightly sweeter blend, Vita Bella also comes highly recommended. As the name suggests, Naturally-Extracted-Tobacco is all about the NET blends, and offers the choice between heat-assisted and cold maceration (allowing you to choose the sort of flavor you get from your chosen blend), as well as an impressively comprehensive range of nicotine levels. Big Spirit is a fairly straightforward tobacco blend, using an additive-free cigarette tobacco to produce a realistic, medium-bodied and dry tobacco vape that captures the taste of analogs in a way most e-liquids can’t. The flavor is regularly described as being the smell you get from a freshly unwrapped pack of cigarettes: clean, pure tobacco without a hint of anything synthetic but with a faint undertone of sweetness. They also offer pipe, cigar and flavored blends, with the cigar option 3-Crown being another favorite from the mixer. Mountain Oak has a wide-ranging selection including some downright delicious juices (Legendary is a personal favorite), as well as five NET blends – some natural and some incorporating elements like coffee and cream or RY4-style caramel sweetness. Southern Gentleman is a fairly straight-up tobacco, built from Virginia, Latika and perique tobacco, with aromatic amaretto incorporating elements of black Cavendish and some ribbon-cut Virginia. As well as receiving plenty of praise for its accuracy of taste, Southern Gentleman is robust, but as far as realistic tobaccos go, it’s also fairly mild, offering a smooth vape with just a touch of sweetness. Apache, Mountain Oak’s English pipe blend, also comes highly recommended. The Duke is a bold, powerful tobacco e-liquid from Indigo Vapor. While OOHRAH and Indigo RY also have some staunch supporters among sweetened tobacco lovers, the nutty, earthy aroma and the genuine punchiness of the tobacco emulation makes the Duke one of the most widely recommended tobacco options available. Reviewers praise its closeness to the real deal, but as is often the case with tobacco juices, it’s the delicate balance with the nuttiness and slight hints of sweetness that really sets this apart from the crowd. Velvet Cloud Vapor bills itself as an artisanal e-liquid mixer, offering many unique blends as well as a few tobacco options. Burley Beard Tobacco uses flue-cured Kentucky and Virginia tobacco, offering a simpler blend than their other, partially-fruity tobacco options. It’s billed as earthy and fresh, and widely praised as offering a straight-up tobacco that’s smooth on the inhale and fairly mild in flavor. It has some sweetness to it, but it’s another that’s widely-cited as being a juice that helped people make the transition from combusted tobacco. House of Liquid is a European mixer widely-known for offering some of the best tobacco e-liquid in the industry, with a particular focus on NET blends. Although they’ve attracted some criticism for reducing the size of their bottles (in preparation for the upcoming EU regulations), their blends still receive unanimous praise for authenticity of tobacco flavor. The Cuban cigar flavored Puros blend is another widely-loved options, but Cigarillos, the first El Toro blend offered by the mixer is the undisputed king, made from Cuban tobacco leaves that have been hand-selected and left to steep for around a month before being filtered and bottled. The blend boasts an earthy, nutty aroma with a slight sweetness, and has spawned tons of reviews from vapers saying it’s the closest they’ve come to a genuine tobacco taste. 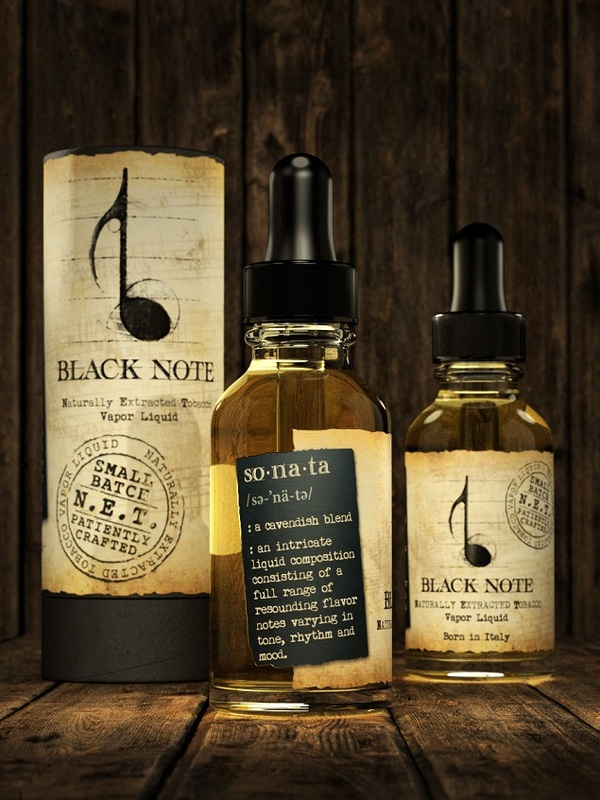 Black Note is a dedicated NET liquid mixer, and they have plenty of great options for lovers of authentic tobacco juices, from the Cuban tobacco Adagio to the basma Cadenza. Their Cavendish blend, Sonata, takes the top spot, though: capturing the complexity, smokiness and richness of the genuine tobacco but taking the flavor to the next level with touches of soft, natural sweetness and subtle undertones of nuttiness from the tobacco. Even if you aren’t usually a fan of NET juices or even if you don’t usually like tobacco e-liquids at all, this one has what it takes to change your mind. One thing that’s beyond all doubt is that this list barely scratches the surface of the plethora of tobacco juices on the market today. Even though most mixers opt to make their tobaccos pretty sweet, there are still plenty of options out there for vapers wanting something that tastes closer to real tobacco. Hopefully this list will give you some new juices to try, and possibly even help you find a new favorite. Despite our efforts, we’ve undoubtedly left some of the best e-liquids in the category off this list, so let us know if we’ve overlooked one of your favorites! Also check out: Best e-liquid vendors of the year! E-Cigarette Forum: The NETty awards! E-Cigarette Forum: The Second NETty Awards!